Hello ... Hello ... my old friends ... It's great to see you once again! 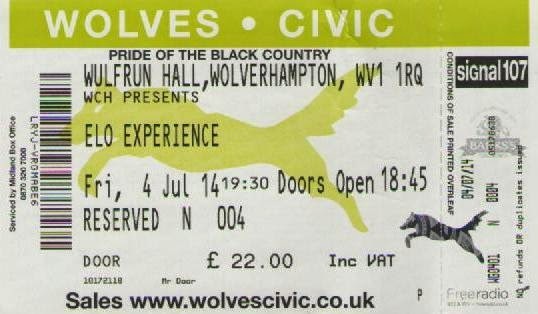 Wolverhampton's Wulfrun Hall was packed to the rafters last night as Hull based ELO tribute band The ELO Experience returned to the 600 capacity venue last night [Friday 4th July] for the latest leg of their 2014 tour. Once again, this professional and accurate band had the masses literally rockin' and reelin' as they delivered the ELO songbook of Jeff Lynne [and, in one case, Chuck Berry!]. The atmosphere seemed all the more charged with excitement following Jeff's recent visit to Birmingham in March and a much anticipated appearance at London's Hyde Park in September just around the corner. This was, again, a fantastic show that truly entertained the audience, as their many waving glow sticks evidenced! 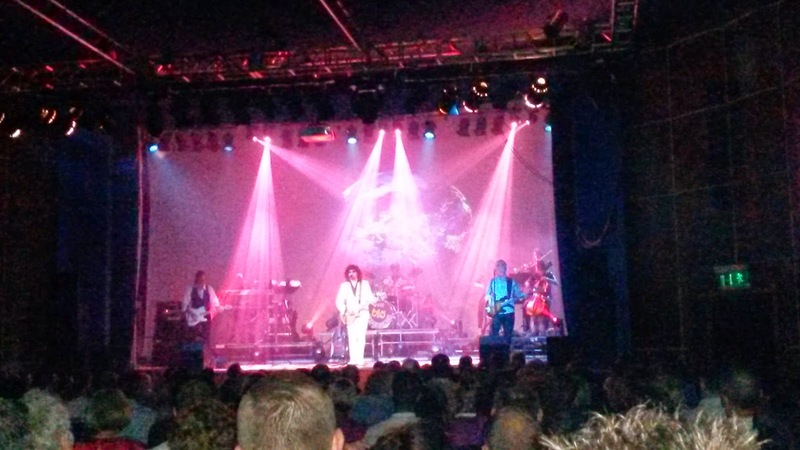 The ELO Experience never cease to amaze me with their attention to detail and their on stage comfort with each other. That the band do not take themselves too seriously is also a good thing. Andy Louis' new wig cemented another solid vocal performance and it was nice to see bassist Pete Smith take a share of of the lead vocals during "Roll Over Beethoven" too. The keyboard and vocoder antics of Steve Hemsley are always superb as is the percussion prowess of Tony Lawson and guitar work of Jan Christiansen. The violin and cello trio also came into their own last night, adding another string to the bow of the band. All the hits were there again with my all-time ELO fave "Can't Get It Out Of My Head" and other classics including "Strange Magic", "Roll Over Beethoven", "Showdown", "The Diary Of Horace Wimp", "Rock 'n' Roll Is King", "Wild West Hero", Hold On Tight", "All Over The World", "Evil Woman", "Rockaria", "Telephone Line", "Turn To Stone", "Shine A Little Love", "Confusion", "Last Train To London", "Don't Bring Me Down", "Xanadu" and, of course, "Mr. Blue Sky". Sadly there was no room this time around for "Latitude 88 North" or "Summer And Lightning" but it is always a pleasure to see and hear most of "Concerto For A Rainy Day" performed live. Yours Truly KJS is still awestruck by their rendition of "Big Wheels" ... and always will be. Where else can you hear the studio recordings of ELO & Jeff Lynne faithfully reproduced in a live setting? Their next major appearance in the Midlands will be a rather attractive gig on Saturday 30th August at The New Alexandra Theatre, Birmingham - complete with their very own spaceship. 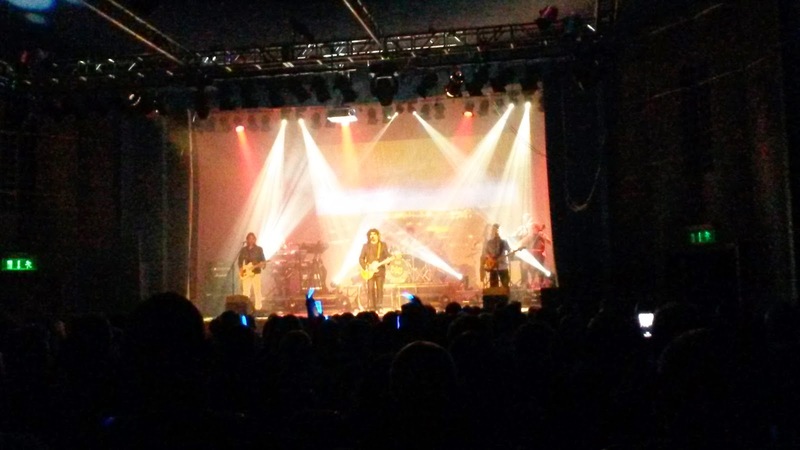 Meanwhile, the band go from strength to strength with a 2015 US tour on the horizon!